How do you go from the lowest of low points to reaching your most important goals? One decision at a time, says Adam Schaeuble, a.k.a. the PHD (Previously Heavy Dude). Adam shares how he achieved a remarkable physical and business transformation by doing at least one thing every day. And you don’t have to be in dire straits to make it work. His strategies work when your business has plateaued, goals seem out of reach, and you can’t seem to motivate yourself to make it happen. 00:00 Interview with Adam Schaeuble. 00:11 Today Steve speaks with Adam Schaeuble. Adam is the host of the top fitness podcast The Million Pound Mission. Adam lost over 100 pounds and has used this as an inspiration to help others. 02:25 Adam tells us how his body transformation and business transformation are linked. Starting with him losing 100 pounds to starting bootcamps that collectively where members have lost 35,000 pounds collectively. 05:50 Adam explains his lifestyle rehabilitation statement. 09:23 Adam talks about being the hero of your own situation. 13:00 Steve talks about hiring a fitness trainer to make him accountable for his fitness. 16:36 Adam tells us how you can add your own weight loss to his website and add to the mission. 20:55 Adam took his inspiration from an unlikely source: McDonalds! 24:07 Adam talks about using Dan Sullivan’s “Unique Ability” concept. 26:17 Steve explains how you must use your unique ability to create freedom for yourself. 29:24 Steve and Adam talk about the importance of having trustworthy people when delegating work. 33:35 Adam explains how to work towards your giant goal without getting overwhelmed. 37:05 Adam tells us how best to get in contact with him. 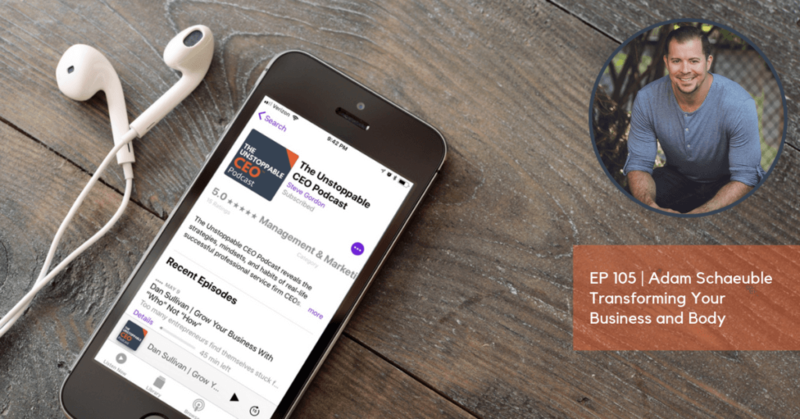 Welcome to the Unstoppable CEO podcast, I’m your host Steve Gordon, and today this is going to be fun. I’ve got Adam Schaeuble here with me a.k.a. the PHD Previously Heavy Dude and he calls himself that I’d never call him that because he’s a big strong guy now and he could probably take me out. But he is the host of the top ranked fitness podcast, the Million Pound Mission. He reached a point in his life where he weighed 327 pounds was already having weight related health issues in his late 20’s and he decided to completely overhaul his lifestyle and his fitness. He ended up losing over 100 pounds and then just being totally inspired by what happened and what he learned. He’s taken that transformation and use that as a way to carry that out to the world. And so Adam I’m excited to have you here and have you share some of your wisdom with us today. Welcome to the Unstoppable CEO. Steve, I’m so excited to be here brother, it’s always an honor that another podcaster asks you to come on and share their platform. So thank you for that, I’m psyched to be with your Unstoppable audience and we are going to really fired up today, brother. So give us some background beyond just what’s in the bio, how do you get to this stage of your journey? My body transformation and my business transformation are linked, so it’s one in the same story and like you said I found myself about 12 years ago now where I weighed 327 pounds, I had a ton of debt, depressed, you know my life was just kind of tanking I was hitting that rock bottom moment and I put my foot down, decided things to change, I needed to make some changes and I start making changes right away. So that night I sat down, I watched a DVD called “The Secret” and started using the Law of Attraction and I put some action behind the attraction. And for the next five years, I went out and knocked out every single goal that I set that night to the point where when I opened my fitness studio I was only seven days from the date that I had set myself five years ago, which is pretty darn cool. And the next one we had 30 people and the next one we had 70 people, and the next one we had a 100 people and then these 100 person waves have been coming in, and I had an official space by then and my community over that five-year time span lost 35,000 pounds. And that’s when things just exploded. So it started as me wanting to get healthy and then helping a few other people get healthy and now run that Million Pound Mission where I’m podcasting every week try to inspire actually and actually tracking a million pounds of results were at just under 55,000 pounds right now the time of recording. So I feel really, really good about. That’s a lot of pounds. It’s a lot of pounds. I mean even if you’re working with people that need to listen in chunks of 100 at a time, that’s a lot of people. Most people probably that you work with I would guess aren’t at all at that level. So that means you’re impacting a ton of lives and that I love to hear when businesses have figured out a way to really kind of crystallize and clearly communicate the impact that you’re going after. You can visualize that, I love the way you describe it. It’s awesome. There’s no way it was all like roses like you, I mean the way you described it, you made the decision you watch “The Secret” and boom five years later magically everything was achieved. It probably didn’t work like that, did it? Right. Right now it was not like that at all, Steve, there were lots of bumps in the road for sure. So I think this is, we haven’t had anybody on whose talked about this kind of a physical transformation in addition to a business transformation. I actually think the physical transformation is much more difficult to do, how did you keep pushing through? How did you stay? You know it’s like we like say around here, how did you stay unstoppable through all of the days where I’m like I don’t want to work out or I really want to go eat that thing that I shouldn’t eat and staying focused on the goals that you had. Yeah, that’s a great question Steve, and this is kind of where the magic is. So podcast listeners listen on up, take notes on this part. I mentioned that I sat down, I watched “The Secret”, I started applying the Law of Attraction but what I actually did was I wrote out … One of the things I teach my clients now is this process of creating a Lifestyle Rehabilitation Statement. So I put that energy behind the statement and I did that every morning and every night, the morning was like it’s kind of like I was standing in a dark hallway and there were doors of opportunity both personal and professional opening and closing but I just couldn’t see it, because I was trapped in that negative mindset. So the other question I asked myself at the end of the day was you know, did I show up for these goals? Did I show up and do something for these goals? There are no days off even if it was just that tiny domino that we’ve flick over, that’s all I needed to do, to be satisfied with that day and then start that chain reaction of momentum. So to me that’s fascinating. I mean, it almost sounds too easy. And that’s advice that it’s out there, I mean I think folks listening it may have come across it before but I think what’s different in what you just described to us is not that you had the statement and not that you read it at the beginning of the day at the end of the day, but the way that you used it. So particularly, I love the way you opened it up and said, “Well this is sort of the intention I’m setting for my day today in the morning.” And I think equally important is the way you use it for accountability at the end to say, “Well, this was my intention and did I fulfill that?” And if not there’s an action that’s going to happen before I go to bed. To me, that’s like the genius right there. We could probably just hang up right now, we’re done, that was the one thing everybody needed. What got you to the point of realizing that? Because I think a lot of people have heard the advice, well you have to write your goals down you have to read them every day. Where do you get to that next level? I just think that it was a concoction of just the environment I created my life when I hit that rock bottom moment like, I knew that things weren’t going the way that I wanted them to go, and I saw a quote there was like an inspirational video that talked about you have to be the hero of your own movie. And then we start winning one decision at a time, that’s when the momentum builds. That is when you truly feel unstoppable just like you’ve gone on the show all the time. Like that’s when you get your momentum is the key for me. And when we know we have good momentum we stoke the fire, and then if we have some bad momentum going that’s when that accountability factor comes in and we say, “Okay, what am I going to do about this? I’m not going to wait for someone else to come and save me. What can I do about this?” That’s super important. Yeah. Languages is key, it’s so easy to slip into using words that really do give you that sort of victim mentality, I think it’s really prevalent today just because of the way society is and media is, it’s almost glamorized to be a victim of something. And there are true victims of things certainly, there are horrible things that happen in the world and people are victimized, but by and large most of us are victims of anything other than what we do to ourselves. Yeah, 100 percent, whether it’s business or weight loss or whatever it’s like people going to that victim mode just from work like, “Oh my boss is a jerk. I have to work so much.” And it’s like, “Okay, well what are we going to do about it? What’s the next decision that we have to make to push that a little domino over it’s not that chain reaction then, yeah it’s something I’m just unwilling to let myself go into victim mode.” We all get sad, we all have emotion swings and things like that, and that’s all I’m talking about. I’m talking about like feeling sorry for ourselves when there’s really just no point in that. That’s just kind of a weak decision that that doesn’t need to happen. So the level of focus, the level of implementation, I don’t run from accountability like I love having coaches, I love having mentors, I love having you know groups I’m accountable to. And I feel like that’s something that a lot of business people and again people on that transformation journey, we fear judgment. We see accountability in judgment as the same thing and it’s not like accountability is support, it’s coaching, it’s mentorship. And it is somebody that knows a little bit more than you do that can help you along the way, and that’s something that nobody should fear. Well, and one of the things that I’ve learned I’ll tell you I’ve probably been more aware of it through this fitness journey, is one of the reasons that I think for anybody in business to the extent that you can take yourself through a physical challenge, you learn a lot about yourself that then translates into how you build your business. I think for all of us when we’ve got that kind of outside set of eyes and the outside accountability, there’s somebody you know if it’s as simple as somebody who’s going to be there like we work out at 5:00 in the morning, so we’re up at like 4:45 which is not an hour that I get up normally. And if I didn’t have an appointment and somebody waiting I’d have probably never been at that hour. And you know with most coaches, most of the best coaches that I’ve ever worked with they were sort of dispassionate about it, if I didn’t do it they didn’t like yell and scream at me. I don’t know what your experiences but the worst like lashing I could guess for a coach, you go, “Oh well, you said you’re going to do that and you didn’t do it. Did you not mean it?” And all of a sudden you get the sense of total disappointment from there, which is motivating. These are huge lessons and I appreciate you coming on today and sharing. I want to take a quick break, we’re going to come back with more from Adam. And Adam has done a fantastic job of building mission into his business, and we’re going to dissect that so that you can learn how you might be able to capitalize on the same thing. We’ll be right back. Welcome back. This is Steve Gordon and I’m talking with Adam Schaeuble, and Adam you’ve created a mission around your business that has really propelled it forward. Can you tell us a little bit about first how you develop the idea and then a little bit about what you’ve learned and the impact that it’s had on your business? Yeah, it’s something that I feel has really been a game changer for me and my business and my community that I’m building, and it’s the sense of that we are in this together, I’m not selling something to you, you are becoming a part of something. And especially with health and fitness and you can attest to this, is that the people who are at home doing workout DVDs by themselves and there’s no group, there’s no accountability, there’s no coaching, there’s no community, there’s no mission, there’s no purpose, they quit. It goes to people that buy all the stuff in January 1st and January 3rd it’s collecting dust. So the idea of the Million Pound Mission, it kind of came from I had lost my hundred pounds, I helped my hometown lose 35,000 pounds and I started getting hit up by all those people wanting me to franchise the concept like this is unique, it’s different, you approach mindset a lot differently with weight loss, let’s franchise it. And I’ve just never been the type of person that’s like, “Hey I want to be in charge of a whole bunch of people and have a whole bunch of business responsible,” I am like a minimalist to a tee like I love to keep things super, super simple. So I created, I didn’t create it, I’m useless with web design but I had somebody develop a piece of my website where if you guys go to millionpoundmission.com, you will see a link to donate your weight loss and there is no opt-in, I don’t need any financial information, no emails, no nothing. You just go, “I heard Adam talked with Steve and I implemented something I did maybe the lifestyle rehabilitation statement I lost 20 pounds.” You go on there, you’re doing it your 20 pounds and you see the ticker go up and all of a sudden the magic happens you’re a part of the mission. And that is just a different thing and I see people going, “Oh I’m going to join his Facebook group. Oh, maybe I’m going to join one of his paid online communities, or I’m just going to listen to every podcast episode,” and people want to be a part of that because I’m not going, “Hey, let me tell you this thing for this 90-day program and then good luck with that.” It’s be a part of this, I’m going to give you everything I’ve got, and I know that if I accomplish this goal of the Million Pound Mission, the financials will take care of themselves. I hope that many people the financial it won’t even be an issue. So that’s kind of where the whole mission based concept started and formulated and it’s on fire right now, people want to be a part of this and it’s super exciting. That’s so brilliant. I mean, if you think about all the different ways that you could generate interest in your business you’ve got something. I love the fact that you’ve got a way, people can come and basically log their pounds and donate them to the mission. It’s almost like the best donation ever it doesn’t cost you anything and you’ve already lost the weight, and you’re really just logging it and you’re basically coming and say, “I identify with this,” and I think for businesses most of the time the thing that keeps you stuck as a commodity because there’s lots of trainers around there, right? I mean before you came up with the Million Pound Mission that was essentially your business and I would guess if you know Bloomington is anything like Tallahassee, you have a hard time throwing a rock and not hitting somebody that does fitness training. So it’s completely commodities just like every industry of everybody that’s listening to this. But you found a way to elevate that so that not only are unique in your community, you’re unique in the world that’s powerful. Exactly, and I have to admit I stole the idea from like the McDonald’s sign where I think over a billion served or whatever, because at our very first studio that I opened we were across the street from McDonald’s, and like I would see that. So we got a little like, it was so expensive too I had to go, I think we can change the numbers that had to go like city ordinances and all this stuff but we would at night as we did our 35,000 pounds of weight loss it was right off the main strip and it’s like us versus McDonald’s and we got a billion served, 10,000, 20,000, 30,000 people like honk their horn and get them out. So yeah that’s where that whole concept started. Once we started going global I’m like, “I have to be able to track this because you know I really truly want to hit that number of a million pounds,” and I just feel like you know it’s a fancy name, it’s a unique name and you know hopefully we hit it and maybe we will, maybe we won’t. So I see a lot of people doing that like, I want to help a billion people but they don’t actually track it and I’m like accountability man. So like I had to track this thing and we probably almost double what we actually are but it’s hard to get people to actually go on the website and log their stuff. So that’s the story I’m talking to myself, anyway. But it’s really cool, it’s super cool. Yeah, I know, I love that. And the irony of using McDonald’s as the inspiration for it is not lost, I think that’s brilliant. So what I think works so well about this and the lesson I think a lot of people listening can take away from it. You’ve got to think creatively, I mean to come up with this you’ve got to look at what you’re doing and think, “How can I create something that people would want to get behind whether or not they did business with me?” And you know it gives you an opportunity to bring them into your world and create a relationship with them I would imagine. Yeah, even things like it’s so easy to get brand promotional partners now and I’ll say, “Okay, X, Y, Z brand if we’ll promote you through our Instagram posts or whatever,” if you will match a pound for dollar donation. So how many pounds we lose this month that are donated to Million Pound Mission, you’ll write a check for that that dollar amount and just like getting brand partnerships go on like that and they’re out promoting our stuff for us. It’s like people just want to be a part of it, because we’re helping people. It’s like feeding hungry children you know except where kind of the opposite with overweight adults, or taking the pounds off. And it’s just a positive thing, it’s a synergistic thing and yet people definitely there the right to get on board. That’s amazing. That probably saves you a lot of money on advertising too. Awesome. Well so, you and I are both followers of a guy named Dan Sullivan and we were talking before the show about this concept that he has written about called Unique Ability. Talk a little bit about what you see is your unique ability and how it’s sort of played into being able to build this business the way that you have. Yeah, I love the concept of Unique Ability and both of us being strategic coach guys and followers of Dan the man, and Dan we trust. I think there should be some sort of shirt within that hashtag in Dan we trust. But it’s just the concept just lit me up when I read about it. And the thing that really took the next level was when they’re teaching us, okay, your unique ability it has to be applicable to all areas of your life. So it can’t be like, I’m a good negotiator because I negotiate deals at work. Well, how does that apply at home? How does that apply you’re around friends you know? Does that go across the board. So with me, my unique ability is across the board, I love to identify a problem area, a danger zone, a sticking point. I love to create a solution and like a step by step process around that solution. And then I love to teach people, how to implement that process and I let them borrow my energy until they build up their own. That’s the thing that I do, whether it’s at home, whether it’s at work, whether it’s with online clients, whether it’s with friends you know I started, you’ve been on my podcast about podcasting called Casting the Pod because I saw an issue with podcasts a lot of beginning level podcasters are quitting way too early because they don’t know what the heck to do and I saw that as an issue. So I am using my unique ability through this new show, to show them exactly what they should be doing bringing veteran podcasters like yourself on there, and we can teach them and help them implement and let them borrow our energy until they build up their own. So I do that across the board and that’s something that also is a nice filter, am I using my unique ability right now, or is this something that I should be delegating to someone else. And that’s an area that a lot of business owners, they say that good is the enemy of great. I say great is the enemy of unique and I’m great at personal training and doing like group fitness classes and things like that, but it’s not my unique ability. So this year I’m exiting all of those tasks just to focus on unique ability skills and action. So it’s a great filter as well. Yeah, it took me a little while to really understand what my unique ability was or is. And then you know as soon as I kind of got locked onto, like, “Oh, that makes perfect sense.” Once you have it, it’s a tremendous filter for looking at all the stuff you’re doing because I mean, when we started businesses we were doing whatever it takes to get the thing going and make it viable. That’s just the nature of the game, but for the business to grow and for your freedom in the business to grow which is I think that’s the elusive peace for most business owners is oftentimes they can grow sales but they don’t have any idea how to grow freedom. And to me, unique ability is the thing that unlocks the freedom because you now are really clear about where your boundaries should be, and if you do it right, you stay inside your boundary and you go build a team of people, and they all need to have different unique abilities than you, so they compliment you they can then take on all these other things. I mean the perfect example is like accounting, my dad’s a CPA I grew up around that business and went to college thinking that maybe that was going to be my major, first accounting class, it was made really clear to me that that was not my path in life. So but I have a CPA here and let me tell you that’s his unique ability, fabulous and he’s got a team that’s fabulous at that. So I stay on my side of the line when it comes to that. So it really gives you some clarity around what you should be doing, and I love that move that you’ve made so you’ve gotten so clear that even though trading is probably a pretty big part of your business. That’s not a role that you should be playing in the business. Yeah, and it’s scary too, like going from something that you’re great at and like I could do personal training sessions all day long and make enough money but I wouldn’t be like fulfilled like my unique ability fulfills me and makes my soul happy. Like that’s when I feel like I’m doing what I’m supposed to be doing. I’m expressing my true purpose, and that is when I go at a level above great. And that’s the unique ability zone. But it’s scary, it’s outside of my comfort zone. That’s why so many entrepreneurs won’t go there, they stick with good, they stick with great, they never go to that unique level because it’s like taking a cold shower and nobody likes that until your body adjust and then you’re cool. So that’s something that I want to challenge entrepreneurs out there is be willing to get outside of that comfort zone a little bit and really get after what you’re truly unique at and go for it. I think the hardest part of making that transition is having trust. If you don’t have people around you that you trust you’re never going to make that shift and you’re never going to get the freedom that can come from it. I mean, for me that when I look at our clients that we work with a lot of business owners who they’ve been successful, but for some of them they don’t have any of that freedom. And I look at what they’re doing and even when they’ve got a team it’s like they hesitate to give stuff to the team and like the first thing they like the alarm bell that goes off in my head is way you need people around you, you can trust if you don’t have them, well then that’s a change that needs to get made. Because if you’ve got that trust, now if you’re clear about your unique ability like you are, I imagine now you’ve got other trainers that you’re delegating that role to, and it’s their unique ability to go in and actually do the training. And so how do your clients feel about that? I mean do they think well, oh no, Adam Schaeuble he should be here for every session. So when you help somebody change their life for the better, there’s a bond there, but there’s also like there’s a little bit of fear there that if you go away that they’re afraid that the way it’s going to come back on. And anytime I change anything about my business the brick and mortar gym especially people freak out about it and I change the schedule I change up with where we do membership, I change my schedule. People like, terrible idea, it’s bad idea. I’ve got a team member that’s been with me from the beginning and he has hated on every single idea that I’ve ever had, but then he eventually gets on board and is like, “Okay, yeah. This is making sense,” but they just get scared that they’re supporting that, that safety net is going to be gone and once they realize I’m still there and they can still plug into as much my energy as they need to. And I’m still going to do like special classes and workshops and things like that, but it’s going to be, that just going to be a little bit different. Then they’ll end up loving the people that I put in my place like I train somebody in, they’re great, and that’s their new hero and we’re cool. So you said to have thick skin, because I’ve got hundreds of clients there at the gym, we’ve got 20 plus employees now. And any time you make a shift and you know we’ve been going since 2009, so we’re in our 10th year doing the group fitness thing. Like any time you make a shift as an entrepreneur as a leader of a company people are going to complain, and people are going to worry but allow that period of adjustment to take place and just survey the land and maybe once all you have to revert back a little bit or make some compromises. I just feel it like I just feel it, and I know in my gut that’s the right thing to do every time I do that. So listen to your gut and don’t be afraid to take action on that. So what’s your best advice for somebody who’s listening to this and say, “God, I want to begin making that transition,” what advice would you give them to sort of begin down that road? I would say you’ve got to look at sometimes, not sometimes, every time, when we set up a big goal of doing a transition like this it’s like staring up at a mountaintop whether it’s a business transition or it is like losing 100 pounds or losing 20 pounds. We look up at that, we get intimidated by that big giant goal and we’re afraid to take action. We get that, that paralysis takes place. So what I’d like to do is like okay I’ve got that giant go out there that transition, I’ve been working on this for like over a year and I wasn’t afraid to play the long game. I understand this is an important thing I can’t just pull the rug out from underneath, all these people that are depending on me to keep them healthy. So I was willing to just line up my dominoes, we talked about this earlier where I said, “What’s the first little tiny domino that I need to knock over? Which class or which person do I need to train in? Which email do I need to send to communicate to that person? ‘Hey I’m looking at making a transition, who do I need to meet with? Who do I need to talk with?’” Before I start worrying about everybody freaking out and all this other accessories stuff. So what’s that first domino that you need to push over? Because I don’t know if you are well-schooled and dominoes or not stay but one domino can knock over domino twice its size then that can knock over domino twice its size. I love that. That idea has surfaced in so many of the interviews that we’ve had by people who are really, really successful and I want to highlight it, and I want everybody listening to know that it keeps coming up. How do you not get overwhelmed? He said that’s really simple, I have a telephone and my first move on all of these things is I just pick up the phone and I make a call like right away. That’s his one little tiny domino and I love that you brought that back up because I think that it’s such a smart strategies, I don’t try and figure it all out just do something because when you do that one thing you’re going to learn from that, what maybe the next thing should be. I love it. You have shared such great wisdom with us today and I know you do a tremendous job on both of your podcasts and congratulations on doing two, I know how much work it is. So where’s the best place for folks to go and get connected with you? Yeah, millionpoundmission.com, that’s the hub, that’s where you can connect all my various adventures and I love to communicate via Instagram Million Pound Mission on Instagram as well. And don’t be afraid to reach out, I love to communicate and send me a direct message or hit me up via email, I respond myself often in video format because I like that. So yeah don’t be afraid to reach out. Awesome. Adam, thanks for being on today. Again, check out millionpoundmission.com we’ll link that up in the show notes and for everybody listening, stay unstoppable.